WoO 87. Cantata on the death of the Empreror Joseph II (S.A.Averdonk), for Soprano, Alto, Tenor, Bass, 4vv and orchestra. Composed in 1790. WoO 88. Cantata on the accession of Emperor Leopold II (Averdonk), for Soprano, Alto, Tenor, Bass, 4vv and orchestra. Composed in 1790.
op. 85. Christus am Oelberge (The mount of Olives, F .X. Huber), oratorio, for Soprano, Tenor, Bass, 4 vv and orchestra. Composed in 1803, revised in 1804. Published Leipzig, 1811.
op. 86. Mass in C, for Soprano, Alto, Tenor and Bass, 4 vv. Composed in 1807. Dedicated to Prince Ferdinand Kinsky. Published Leipzig, 1812.
op. 80. Fantasia in c, for pianoforte, chorus and orchestra (see 'Solo instruments and orchestra'). Composed in 1808. First performed on December 22, 1808. Dedicated to Maximilian Joseph, King of Bavaria. Publication: London, 1810, Leipzig, 1811. (Solo part completed 1809). WoO 95. Chor auf die verbuendeten Fuersten 'Ihr weisen Gruender' (C. Bernard), 4 vv, orchestra. Composed in 1814. (For Congress of Vienna). op. 136. Der glorreiche Augenblick (A. Weissenbach), cantata, 2 Sopranos, Tenor, Bass, 4 vv and orchestra. Composed in 1814. (For Congress of Vienna, also published with new text by F. Rochlitz as Preis der Tonkunst (Vienna, 1837). Published Vienna, 1837.
op. 112. Meeresstille und glueckliche Fahrt (Goethe), probably as a cantata, 4 vv and orchestra. Composed in 1814-1815. Dedicated to Johann Wolfgang von Goethe. Published Vienna, 1822.
op. 123. Mass in D ('Missa Solemnis'), for Soprano, Alto, Tenor, Bass, 4 vv, orchestra, and organ. Composed from 1819 - 1823. Dedicated to Archduke Rudolph. Published Mainz, 1827. (Originally intended for Rudolph's installation as cardinal, March 9, 1820). Opferlied. 'Die Flamme lodert' (F. Von Mathisson), for Soprano, Alto, Tenor, 4 vv, 2 clarinets, horn, viola, violoncello. 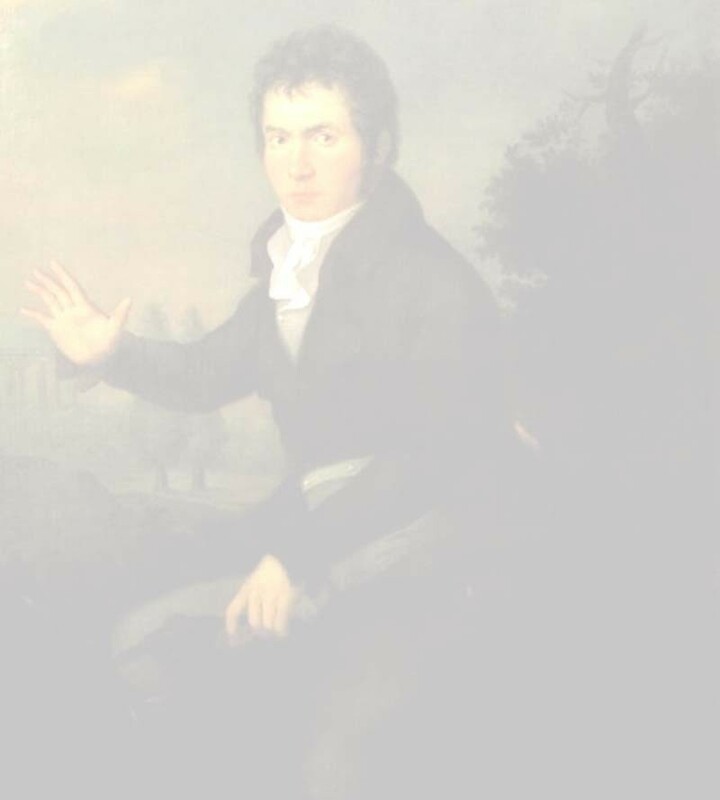 Composed in 1822.
op. 121b. Ofperlied, 2nd version, for Soprano, 4vv, orchestra. Composed in 1823-1824. Published Mainz, 1825.
op. 122. Bundeslied 'In allen guten Stunden' (Goethe), for Soprano, Alto, 3vv, 2 clarinets, 2 horns, 2 bassoons. Composed in 1823-1824. Published Mainz, 1825.
op. 125. Symphony no. 9 in d, Choral ending, 'Ode an die Freude' (Schiller), see Symphonies.